Linkr.in is a free web link tool that makes it easy to share multiple links in one link. A free service that enables you to add more than one link to an Instagram bio on a single landing page. Generate a custom page for yourself or business, with a link to share on any social media network profile or bio. A free landing page with a custom link from our platform to feature a collection of multiple links to share in one link. Add the generated custom link to social media bios and share in social networks to fans and followers. Add links to forum signatures and share via email. As an artist, musician, blogger, webmaster or online marketer, you can easily share multiple URLs in a bio with our single landing pages. Share new track releases, playlists or profiles from Soundcloud and share a Twitch TV channel or Youtube videos. 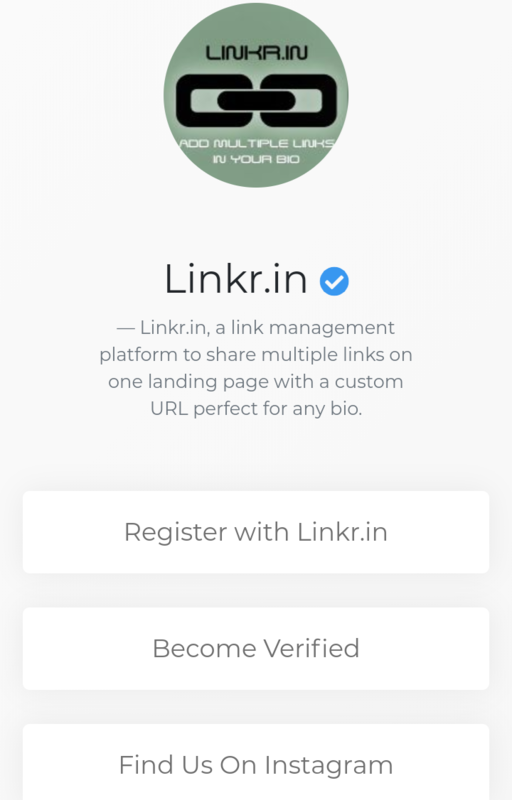 Share multiple links on an Instagram bio or social media profile and with only one link in the bio from Linkr.in. Sign up as a free member to create a free landing page on a custom link. Share multiple links in one link and monitor featured link click through rates. There is also the opportunity for members to have a verified account on our platform. Share links and edit pages via the member dashboard. Add video links, music, lead capture pages, social media profiles, product pages and blog posts. Share a collection of links in an Instagram bio and all you need is an account to begin adding links. Claim your username, customize the landing page by adding multiple links and then add your custom link to an Instagram bio. When visitors click on the link in bio, they will be directed to the landing page with links listed. View videos, stream Twitch TV channels and listen to music on the landing page. You can easily share multiple URLs in Instagram in one URL, with a free landing page and custom username as your bio link which is perfectly suited for an Instagram bio. Generate a custom page to share links. Drag and drop to re-order upon adding more links via the dashboard. Direct followers to one custom link and add the link to an Instagram bio with multiple links in one link.